Located about 45 kms away from Kochi, Kalady is the birthplace of the great ninth century philosopher and religious performer Sri Shankaracharya. One of Hinduism's most influential figures in India, Shankaracharya was devoted to Lord Shiva. Living in the 8th century, Shankaracharya founded the school advaitha philosophy. Situated on the north banks of the Periyar river, this tiny village is now a popular place of pilgrimage. Cradled in green fields, the place has a small temple complex and the Sringeri Math said to mark the site of Shankarachary's house. It is located quite near to the Keerthi Sthambam on the banks of river Periyar. Run by the Sringeri Math, it is a large, partly open structure situated right on the northern bank of the river Periyar or Purna. It is open to all pilgrims irrespective of religion or caste. Of the two shrines here, one is dedicated to Sri Sankaracharya and the other to Goddess Saradamba, guardian deity of Sringeri. Both these are eight-sided and together enclosed in an eight-sided structure. The evening prayers are conducted with chanting accompanied with the rhythmic ringing of cymbals at the small temple of Vinayaka or Ganapati situated nearby. Sri Sankaracharya was born at Kalady as the only son of Sivaguru and Aryamba, a Kerala Brahmin couple. His early life was marked by several miraculous exploits that single him out for a divine role. Among the miraculous happenings associated with his life is one, when he is believed to have diverted the course of the river Poorna, then flowing one and a half kms away from the house, for his aged mother so that she could have her daily bath in the river without walking a long way. Even today one can see the river has taken an uncharacteristic turn towards the Sringeri Math shrine, believed to be the site of Sankara's house. The extra ordinary intelligent boy mastered the Vedas and completed his studies when he was merely 16 years of age. He then spent many years of his life preaching the Vedic Dharma as well as its universality and superiority. He established four 'Maths' at Sringeri, Dwaraka, Joshimath and Puri. At the age of 32, he attained 'mahasamadhi'. Besides the road nearby, there is an 8 storey-high brilliantly painted memorial, Sri Adi Sankara Keerthi Sthambam here. Built by the Kanchi Mutt, it is 45 m tall octagonal tower commemorates Shankarachary's life and work in words, symbols and pictures. The entrance to the memorial, is guarded by two elephant statues. Several large statues of Ganapati, Adi Sankara, Karthikeya, Surya, Vishnu and others are also housed in this memorial. This is a holy spot in Kalady where Aryamba, the mother of Sri Adi Shankara was cremated. The lamp post made of black stone just near this samadhi was in existance from the time of Sri Shankara. Timings: 6 am-1 pm, 4-8 pm. Near to this is a Ganapati Shrine. Dedicated to Lord Krishna, the family deity of Sri Adi Shankara, Sri Krishna Temple is located to the west of the Sringeri Mutt temple complex. Built in the typical Kerala style, this small temple is under the Kalady Devaswom and the worship is conducted by Namboothiris. Timings: 5.30 -11am, 5.30 - 7.30 pm. Crocodile Ghat or Muthala Kadavu is the place where Sree Shankara took 'Manasa Sanyasam' or his vows of renunciation. It is situated on the bank of the Periyar. Even from a young age, Shankara was spiritually inclined and wanted to take up sanyasa much against his mothers wishes. Once while Shankara was taking bath in the Periyar river one day, he was caught by a crocodile. Shankara demanded his mother Aryamba to permit him to take up sanyasam so that the crocodile will leave him. His mother was forced to give permission and then the crocodile released him immediately, and the ghat came to be known as Crocodile Ghat. Sri Sadvidya Sanjivini Rig Veda Patashala at Kalady is a unique institution that teaches Vedas and Sastras in the traditional method. 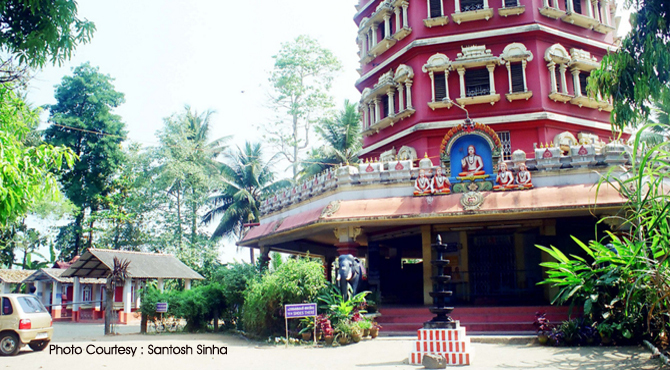 The patashala established by Sri Sacchidananda Shivabhinava Nrisimha Bharati Mahaswamigal, is managed by the Sringeri Mutt.